Image caption Chardon City police chief Tim McKenna told reporters "this investigation is going to be very long"
A student has been killed, another declared brain dead and three others injured in a high school shooting in Chardon, Ohio, police have said. 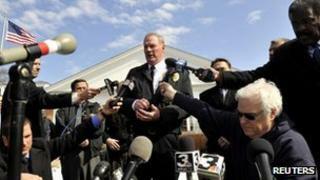 The gunman opened fire in the cafeteria at Chardon High School, the FBI said, which was busy at breakfast time. The suspected gunman, identified by the court as TJ Lane, will appear for a hearing at Geauga County Juvenile Court on Tuesday afternoon. One of those wounded is in a critical condition, one in a serious condition. The third victim is in a stable condition, and all three remain in hospital. Schools in Chardon will be closed till Friday, when classes will resume, and a vigil has been scheduled for Tuesday evening. Russell King Jr, 17, was declared brain dead but still has a heart beat, the Cuyahoga County medical examiner's office said. On Monday, Daniel Parmertor, 16, was declared dead after being taken to hospital after of the shooting. He had been waiting in the cafeteria for a bus to a vocational school. "We are shocked by this senseless tragedy," his family said in a statement. "Danny was a bright young boy who had a bright future ahead of him." A student who witnessed the attack told US media it appeared that the gunman targeted a group of students sitting together. Local news reports said the suspect, who opened fire at 07:30 local time (12:30 GMT), was chased out of the building by a teacher before turning himself in to two people in the vicinity of the school. "I am happy to tell you that the student that did the shooting is captured," a sheriff's official said to reporters at the scene. "He actually turned himself in to a couple of innocent bystanders just north of the city here in Chardon township." Some students said they recognised the shooter, but police said the suspect would not be identified because he was a juvenile. By early Monday afternoon, police and FBI had surrounded a house in a nearby rural neighbourhood. FBI officials would not comment on a motive. But 15-year-old Danny Komertz, who witnessed the shooting, said the suspect was known as an outcast who had apparently been bullied. One boy who was in the cafeteria when gunfire broke out told US news channel MSNBC: "I thought it was firecrackers at first, I wasn't sure. "And then I saw a bunch of people running out. So I started running... I heard someone yell behind me: 'Get down'. And I heard a bunch of shots fired behind me." Students were evacuated to a nearby elementary school, where parents hurried to collect them. Chardon High School has about 1,100 pupils. Chardon, a town of about 5,000 residents, is about 30 miles (48km) east of the city of Cleveland. Monday's shooting was the worst incidence of gun violence at a US high school in 11 months and the worst shooting in Ohio since late 2007, the Brady Center to Prevent Gun Violence told Reuters news agency.